2 May 2013 Nanobiotechnology experiments on the air on Geo Scienza (RAI3). 19 June 2012 The SuperFOx-2012 conference (First Conference on Superconductivity and Functional Oxides), organized by our group, has been held in Como (19-22 June 2012). The activity of the group is focused on the fabrication and testing of magneto-electronic devices based on nanostructured artificial materials for applications in NanoBiotechnology and Spintronics. The materials are spatially confined down to nanometric scales by advanced preparation techniques (MBE, PLD, magnetron sputtering). Nanostructures having lateral definition and prototypal devices are obtained by means of lithographic techniques (optical and electron-beam lithography) and characterized by advanced magneto-electro-optic techniques. NanoBiotechnology experiments are performed in a laboratory for biological applications. Moreover, collaborations with external groups, both Italian (Elettra,Trieste; ICRM, Milano; MDM, Agrate; Italian Institute of Technology...) and international (ICMAB, Spain; NanoGune, Spain...) are currently running. Nanomedicine is a very rapidly emerging field, in which nanotechnology is employed in connection to medicine for different applications (single-molecule recognition, high-sensitivity screening test, etc.). Magnetic nanoparticles with functionalized surfaces are used as labels for single molecule study, cell manipulation and biomagnetic sensing: in the latter case, magnetic beads are employed to detect target molecules at the surface of magnetic sensors where probe molecules are immobilized. Our research in the biosensing field aims to the development of a new type of compact diagnostic tool for the analysis of biomarkers in biological samples, oriented to point of care medical applications and based on a lab on chip approach. Usually, the detection of biological molecules relies on the binding of a target molecule to a label that produces an externally observable signal. In our lab, a "magnetic" approach to biosensing is used: magnetoresistive sensors based on Anisotropic Magneto Resistance (AMR) or Tunneling Magneto Resistance (TMR) are used in combination with functionalized magnetic markers (beads). The beads are specifically attached to the target molecules, and their magnetic stray field is picked up by embedded magnetoresistive sensors as a change of electrical resistance. State-of-the-art TMR sensor microarrays, fabricated by magnetron sputtering and optical lithography, are employed for detecting DNA-DNA biomolecular recognition events in collaboration with ICRM (Istituto di Chimica del Riconoscimento Molecolare). This work has been supported by the Cariplo Foundation via the project SpinBioMed and is actually granted by Regione Lombardia via the project LOCSENS. Controlled transport of single magnetic beads of micro- and nano-metric size is realized by domain-wall motion in Permalloy conduits. After targeting with biomolecules, such magnetic beads can be employed for "drop by drop" drug delivery to tissues, cells, ... in order to test their response down to the single molecule. The detection of the bead position along the conduits is another fundamental issue, that we realize employing AMR and capacitive sensors, with sensitivity down to the single bead. For such a technology, different applications to biology are currently explored, ranging for cell manipulation, magnetic agitation, neuron targeting. This work has been supported by 5x1000 fundings of Politecnico di Milano via the project Magnetically Controlled Single Molecule Delivery (MCSMD). Fundamental experiments of nano-beads manipulation via magnetic field have been performed on the air by Riccardo Bertacco and Daniela Petti, on Geo Scienza (RAI3). Neurotransmission is the most important mechanism through wich neurons communicate thus generating all brain functions, from the simplest ones (reflexes) to the most complex ones, such as cognition and behaviour. Understanding brain circuit mechanisms requires to bridge knowledge from single cell level up to neuronal ensembles. This implies cross-connecting investigations at the cellular and circuiting level. The aim of the Cariplo grant UMANA (Ultrasensitive Magnetic Array for recording of Neuronal Activity) is to employ a magnetic approach to nanotechnology-based platforms for the in-vitro investigation of neuronal functions. Neuronal cells will be grown by the IIT partner of the project on dense Multi Magnetic sensor Arrays (MMA), able to record the magnetic signal arising from the ionic current pulses along the axons. The aim of the project is the characterization of physiological and pathological network plasticity in mices, model of human hereditary epilepsy. Epitaxial growth of insulator oxides on semiconductors is a key topic in electronics and spintronics, and Ge, due to its high electronic and hole mobilities, represents a promising candidate for the next generation high performance Complementary Metal-Oxide-Semiconductor Field-Effect Transistor (CMOSFET). Moreover, Germanium is expected to play a relevant role in Spintronics, due to the large spin-orbit splitting allowing spin manipulation via external fields, thus envisaging the development of "spin-devices" (such as spin-transistors and spin-valves) where the charge is substituted by the spin as information carrier. Our research in this field is focused on Fe/MgO/Ge(001) heterostructures, grown by Molecular Beam Epitaxy and magnetron sputtering and characterized in-situ by electron spectroscopies and diffraction techniques. The spin transport properties are measured by optical and magneto-transport techniques on protoypical devices fabricated by (optical and electron-beam lithography), such as spin-photodiodes and lateral transport devices. In this frame, we recently realized and reported in Advanced Materials the first demonstration of room-temperature operation of Ge-based spin-photodiodes for integrated electrical detection of the light polarization, finally opening the way towards a Ge-based spin-opto-electronics. A second research line on semiconductor spintronics focuses on the narrow gap ferroelectric semiconductor GeTe, for which the opportunity for the electric Control of the Giant Rashba Effect has been predicted. In-situ and synchrotron-based (PSI, Elettra) characterization of GeTe thin films are in progress, in order to evaluate the opportunity of realizing a spin-transistor with GeTe employed as gate and active channel. Single phase multiferroic materials and heterostructures recently attracted larger and larger attention due to their potential for application in novel spin-electronic devices: they exploit magnetoelectric coupling, allowing for the electrical control of the magnetic properties, and viceversa, opening the way to a new generation of magneto-electrical devices and solid-state memories. Our research focuses on the magnetoelectric coupling of thin magnetic films (few nanometers thick) of 3d-metals and alloys (such as Fe and CoFeB), with in-plane or out-of-plane magnetization, grown by molecular beam epitaxy and magnetron sputtering, on BaTiO3 (100) films, grown by pulsed laser deposition in a MBE/PLD cluster tool, and substrates. This consitutes a prototypical interface between a ferromagnet and a well known piezo-ferroelectric material. By employing magneto-electric and magneto-optic characterization tools, also in collaboration with external institutions (Elettra, Trieste, and ICMAB, Spain), we explore the relationship between electrical fields applied to BaTiO3 and the magnetic properties (magnetic moment, coercive field) of the ferromagnetic side of the interface. In this frame, we demonstrated the electrical tuning of the magnetic properties of Fe films by electric fields applied to BaTiO3. This result recently lead to the electrical control of the TMR in magnetic tunnel junctions grown onto BaTiO3 films, finally opening the way towards a new-generation of electrically controlled magnetic memories. This research has been supported by the Cariplo Foundation via the project EcoMag. Spintronics is an important area of modern condensed matter physics which has led to new means for reading, writing, and storing information. Magnetic tunnel junctions (MTJs) used in modern hard-drive read heads and magnetic random access memories comprise two ferromagnetic electrodes whose relative magnetization orientations can be switched between parallel and antiparallel configurations, yielding to two different memory states via the magnetoresistance effect. In spintronics, ferromagnets play, at the moment, an undismissable role, but from the applications perspective, it is particularly appealing the introduction of antiferromagnetic memory elements insensitive to external magnetic fields. Our research is devoted to the fabrication via magnetron sputtering of antiferromagnetic tunnel junctions (ATJs), electrically readable magnetic memory devices which contain no ferromagnetic elements and which store the information in an antiferromagnet (AFM), i.e., in a magnetically ordered component producing zero stray field and robust against magnetic field perturbations. Indeed in this ATJs metastable states corresponding to different spin configurations of the AFM can be set by cooling the sample and crossing the Néel temperature in external magnetic fields of different orientations. These metastable states can be detected electrically due to an analogous effect to the AFM tunnelig anisotropic magnetoresistance (TAMR). This work is supported by the Cariplo grant Magister (Magnetic Information Storage in Antiferromagnet Spintronic Devices), in collaboration with CNR-SPIN - Casti Laboratory. High sensitivity magnetic biosensing by MgO-based magnetic tunneling junctions applied to DNA and protein biomolecular recognition. Partners: IFOM Fondazione Istituto FIRC di Oncologia Molecolare (Milano), Euroclone SpA, ST, Diapro Srl, ICRM, Université de Strasbourg, Stanford University. On chip manipulation of biological entities by domain wall motion: controlled transport and integrated detection, cell targeting, mechanobiology. Magnetic sensing of neuronal activity in artificial neuronal network patterned on chip, by arrays of spintronic magnetic sensors. Contact persons: Riccardo Bertacco, Daniela Petti. -Study of the giant-Rashba splitting in the ferroelectric semiconductor GeTe, displaying intrinsic interplay between spin and dielectric polarization. -Tunneling electro resistance in magnetic tunneling junctions with BaTiO3 barrier. -Development of novel spintronic devices without ferromagnets, exploiting the high stability of information stored in antiferromagnets and the absence of stray field: IrMn-based memory elements, with room temperature operation and all-electrical reading/writing. -Patterning of magnetic nanostructures in continuous, exchange biased, magnetic heterostructures for storage applications and reconfigurable magnetic logic devices. Contact persons: Riccardo Bertacco, Matteo Cantoni. G. Radaelli, D. Petti, E. Plekhanov, I. Fina, P. Torelli, B. R. Salles, M. Cantoni, C. Rinaldi, D. Gutiérrez, G. Panaccione, M. Varela, S. Picozzi, J. Fontcuberta, and R. Bertacco: Electric control of ferromagnetic order at the Fe/BTO interface, Nature Communications (2014, in press). 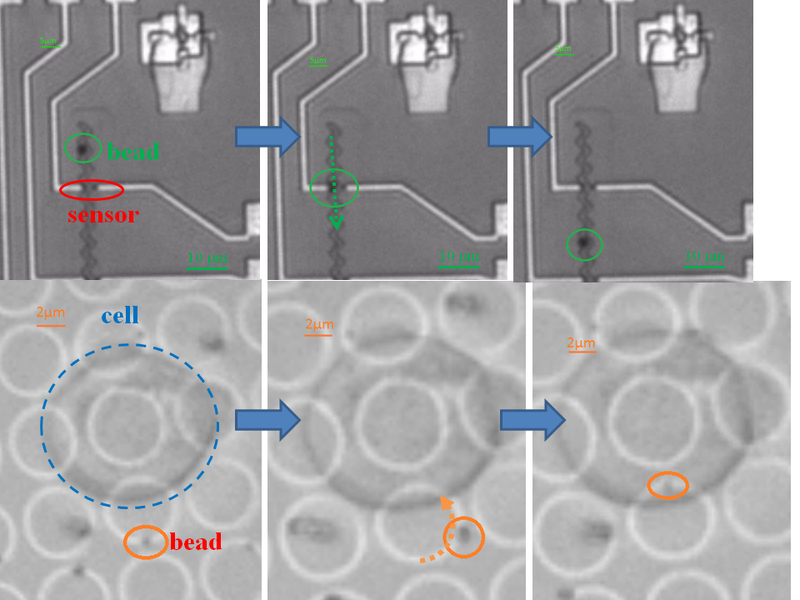 E. Albisetti, D. Petti, M. Cantoni, F. Damin, A. Torti, M. Chiari and R. Bertacco: Conditions for efficient on-chip magnetic bead detection via magnetoresistive sensors, Biosensors and Bioelectronics 47, 213-217 (2013). D. Di Sante, P. Barone, R. Bertacco, and S. Picozzi: Electric Control of the Giant Rashba Effect in bulk GeTe, Advanced Materials 25 (4), 509-513 (2013). M. Pernia Leal, A. Torti, A. Riedinger, R. La Fleur, D. Petti, R. Cingolani, R. Bertacco, and T. Pellegrino: Controlled Release of Doxorubicin Loaded within Magnetic Thermo-responsive Nanocarriers under Magnetic and Thermal Actuation in a Microfluidic Channel, ACS Nano 6 (12), 10535-10545 (2012). C. Rinaldi, M. Cantoni, D. Petti, A. Sottocorno, M. Leone, N. M. Caffrey, S. Sanvito, and R. Bertacco: Ge-based spin-photodiodes for room-temperature integrated detection of photon helicity, Adv. Mater. 24, 3037 (2012). M. Cantoni, D. Petti, C. Rinaldi, and R. Bertacco: Bandstructure line-up of epitaxial Fe/MgO/Ge heterostructures: A combined x-ray photoelectron spectroscopy and transport study, Appl. Phys. Lett. 98, 032104 (2011). M. Donolato, P. Vavassori, M. Gobbi, M. Deryabina, M. F. Hansen, V. Metlushko, B. Ilic, M. Cantoni, D. Petti, S. Brivio, and R. Bertacco: On-chip manipulation of protein-coated magnetic beads via domain-wall conduits, Adv. Mater. 22, 2706 (2010). S. Brivio, C. Magen, A. A. Sidorenko, D. Petti, M. Cantoni, M. Finazzi, F. Ciccacci, R. De Renzi, M. Varela, S. Picozzi and R. Bertacco: Effects of Au nanoparticles on magnetic and transport properties of La0.67Sr0.33MnO3 ultrathin layers, Phys. Rev. B 81, 094410 (2010). M. Donolato, M. Gobbi, P. Vavassori, M. Leone, M. Cantoni, V. Metlushko, B. Ilic, M. Zhang, S. X. Wang, and R. Bertacco: Nanosized corners for trapping and detecting magnetic nanoparticles, Nanotechnology 20, 385501 (2009). M. Bowen, A. Barthélémy, M. Bibes, E. Jacquet, J. -P. Contour, A. Fert, F. Ciccacci, L. Duò, and R. Bertacco: Spin-polarized tunneling spectroscopy in tunnel junctions with half-metallic electrodes, Phys. Rev. Lett 95, 137203 (2005). R Bertacco, M Cantoni, D Petti, C Rinaldi, M Leone: Dispositivo rilevatore ottico spintronico, MI2011A000211, Politecnico di Milano (2011). R Bertacco, M Donolato, M Gobbi, M Cantoni, D Petti, S Brivio, V Metlushko, B Ilic, P Vavassori: Manipolazione di particelle magnetiche in circuiti per la propagazione di pareti di dominio magnetiche, VI2009A000026, Politecnico di Milano (2009). R Bertacco, M Donolato, M Gobbi, M Cantoni, S Brivio, D Petti, P Vavassori: Manipulation of magnetic particles in conduits for the propagation of domain walls, PCT/EP2010/000879, nanoGune Consolider (2009).